I Have a Book Type – The Bookshelf of Emily J.
I’ve decided that there is a type of book that I like more than any other. It is a book that explores art/literature and artists/writers and that jumps back and forth between time. It is a book that includes old letters that somehow inform the present day of the characters. It is a book that is smart, but romantic, deep, but fun and gripping. I’m not sure that I’m describing it well, but perhaps with a few examples you’ll see what I mean. 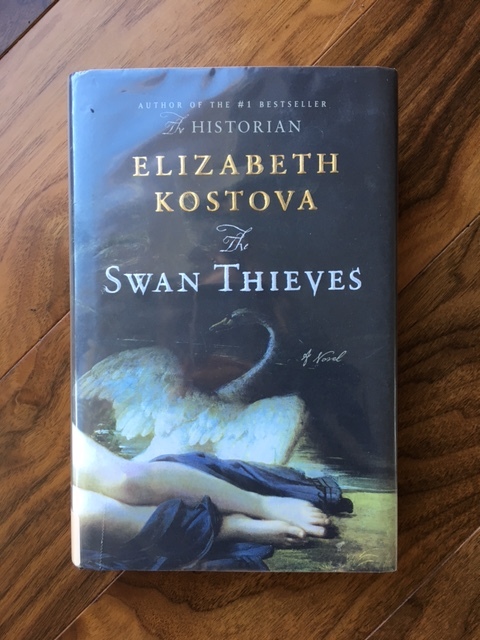 Right now, I’m reading (and can’t put down) Elizabeth Kostova’s The Swan Thieves (2010). (Thank you to blog reader Dale Robards who recommended this book to me!) It is about Robert Oliver, a famous painter who seems to have gone mad and who tries to attack a picture in the National Gallery in Washington, D.C. He is institutionalized, and his therapist is seeking answers, but Robert won’t talk. The narrative is told from the perspectives of his therapist and the women connected to Robert that the therapist interviews. Intertwined in these moments of research and discovery are letters from Paris in the 1870s between a married woman and her husband’s uncle. They are letters that Robert has been reading and rereading in his room, and it seems as if those letters are the key to his madness. I still don’t know what the outcome will be, but I’m starting to assume that Robert is (or thinks he is) a reincarnated version of the man who writes the letters. As I’ve read this book, I keep thinking about other books that are similar and that I have thoroughly enjoyed. There was Donna Tartt’s The Goldfinch (2013). There was What I Loved (2003) by Siri Hustvedt. There was Possession (1990) by A. S. Byatt. All of these books have some element of art/literature, old mysterious letters, and troubled characters who try to make sense of the world through both. And I have absolutely loved reading each one of these novels. What is your book type? I don’t think I’ve discovered my book type yet but I reckon ‘mystery will have something to do with it once I’ve worked it out. Great post! Mysteries are always fun. Thanks! Though I favor King, Poe and Lovecraft with occasional Dean koontz and Catherine Cookson, I don’t really have a book type. Any genre would do as long as it is written in the language I understand and speak. Meaning if the book moves and stay with me, inspires me, makes me green with envy wishing I wrote it myself. Ah, that is so true. I do feel envy wishing that had written certain books, and those are the ones you know speak to your soul. Great description! Loved The Goldfinch! Have yet to read The Swan Thieves or Possession. What I Loved is included on my ever-growing TBR. Not sure I have just one book type, but I do love historical fiction with a mystery, or even nonfiction with a mystery! I also adore mysteries, much literary fiction, fiction, historical fiction. Occasionally I’ll pick up science fiction or fantasy, but not very often. And though I love reading it, feel as if I neglect nonfiction. Though I have read more of it this year than in the past years, so that’s good! I rarely read graphic novels or romance, and refuse to touch horror! I love how you sum it up: historical fiction with a mystery. That helps me to put my thoughts on these types of books into a tidier description. 🙂 I hope you like What I Loved. I think I have a lot of book types. Is that allowed? 1) Books with intertwining plots and characters. 2) Books based on historical figures and/or events. 3) Books that involve exploration and/or sea-faring adventures. 4) I had another one, but now I’ve forgotten it. 5) I’m sure there are others I’m not thinking of right now. I have actually see The Swan Thieves several times at our thrift store (where I get most of my books), but I didn’t know anything about it except that I had tried reading The Historian a few years ago and couldn’t get into it. The Swan Thieves sounds better – I will keep my eye out for it – I’m sure it will be back! I love your list! It is so accurate and perfect for all of us book lovers. I hope you like The Swan Thieves. I love The Historian too, but I’m a huge Dracula fan, so that helped. I don’t really remember The Swan Thieves, although I loved The Historian. Thanks for the mention of the book by Siri Hustvedt, though, because her The Blazing World was one of my absolute favorites. I need to read more! Hustvedt is amazing! I just discovered her recently on the recommendation of a good friend. I’m glad you like her work too. Yes, you must read The Blazing World. It’s right up your alley. I like this type of book too. Have you read People Of The Book by Geraldine Brooks? Or perhaps it was you who recommended it to me… now I forget. It’s a good one in this type. I’ll be adding The Swan Thieves to my list. It’s hard for me to pick a favorite type as I have several types that really grip me. I like the science writing of Quammen and his ilk, I like true life adventures like Endurance, Touching the Void, The Last Grain Race, Rowing the Atlantic. I like adventures about the sea and sailing especially. I like thinking about people actually doing those things! Not just fiction – but actually living those adventures. I’ve got a long list so I’ll stop there. It’s too difficult for me to name a true favorite type or genre. Right? It is so hard to name just one type or one author or one genre. There are so many things to like about all of them. I’ll check out some of the true-life adventures you mentioned. Thanks! And according to my Goodreads list, I have read People of the Book, but I don’t remember it! I do like Brooks’s work and I have read much of it. I liked March the best. This sounds amazing, how have I missed this?! I’m like you, I really love novels that have two connected stories going on, one in the past and one in the present. Kate Morton and Emma Darwin do this well I think, although they’re on the lighter rather than the deeply literary side. I’ll look into them. Lighter books are always nice! I hope you like it as much as I did! I’ll look for The Children’s Book. I loved this book! I’m also excited for her new one “The Shadow Land”. The recommendation of “The Children’s Book” is perfect. It might feel like it takes a while for you to get into it but it’s magic and so worth the persistence. There’s a new one? I can’t wait!!! I don’t know if this fits your criteria well, but a book I really enjoyed that includes a tour of the art museums in Europe, a story of a disintegrating marriage and parent relationship, and a funny, self-deprecating narrator is Us by David Nicholls. Have you read it? And you pose a really interesting question! I think my main book type is one that explores relationships (especially family and marriage), whether it’s funny like Us and Where’d You Go, Bernadette or something darker or more serious. I like those family relationship books too. That is a good type as well. And no, I have not read that one. I’ll check it out! I know exactly what you mean! I have a penchant for books that skip backwards and forwards through time, use intelligent language and really focus in on their character(s) and what makes them tick. I’m not sure if I have a favorite “type.” If I do have a “type” it would be similar to yours. I love stories that are not linear. I love multiple plot lines through several eras and places. Right now it hit me that my type might be polyphonic. If there is more than one voice telling the story- I’m hooked. Great post! I like that description: polyphonic. I think I agree. I’ve always loved books from multiple points of view. Thanks for the comment!